A formidable Indian cricket team completely dominated an out of sorts New Zealand for a series-clinching seven-wicket win in the third ODI, continuing to send a resounding message of its near invincibility to every ICC World Cup 2019 opposition. 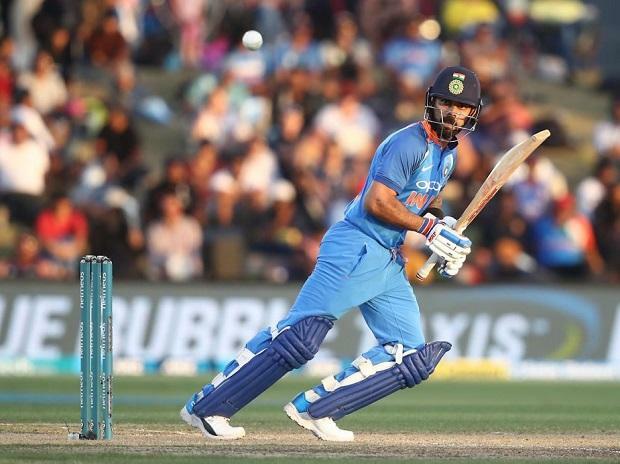 With an unassailable lead in the five-match series, skipper Virat Kohli signed off his tour Down Under on a high with a first ODI series win in New Zealand in 10 years. However, it is to be noted that prior to this, India played just one series here since the one in 2009. It was a complete team effort after the bowlers shot New Zealand out for 243 in 49 overs with all-rounder Hardik Pandya (2/45 in 10 overs) making his presence felt with the ball as well as on the field. Pandya was playing his first match after the suspension on him for sexist remarks on a TV show was lifted. The chase was a cakewalk with skipper Kohli (60, 74 balls) and his deputy Rohit Sharma (62, 77 balls) adding 113 runs for the second wicket to set up the victory in only 43 overs. With the pitch on the slower side, the two fluent stroke-players had to keep it slower than usual but even that didn't come in the way of another comprehensive performance. Once Shikhar Dhawan (28, 6x4) was dismissed, caught in the slips off Trent Boult, Rohit, who till then went slow, finally opened up. He signalled his intentions with a straight six off Mitchell Santner. Kohli, at the other end, punched Lockie Ferguson through the point and then hit Ish Sodhi for two boundaries. The first was a top spinner that was pulled in the mid-wicket region while the next was a wrong 'un on the fifth stump which he cut for another boundary. Rohit, who has treated Ferguson with a lot of disdain, than hit a front-foot pull off the bowler for his second six. His skipper also got a six off Ferguson even though he was not in complete control as the ball flew off the top edge. Rohit, who now has 39 half-centuries, was stumped off Santner's bowling, when he tried to go for an ugly hoick. His innings had three boundaries and two sixes. Kohli, who now has 49 half-centuries in ODIs, also hit six fours apart from the the six off Ferguson. Just when a 40th ODI ton was looking imminent, Kohli's uppish drive off Boult failed to clear Henry Nicholls at extra cover. However, Dinesh Karthik (38, 38 balls) and Ambati Rayudu (40, 42 balls) did their cause no harm with an unbroken 77-run stand for the fourth wicket to steer the team home. Earlier, during New Zealand innings, Pandya seemed unfazed by the tribulations of the past few weeks and made a significant contribution to India's impressive bowling effort. Pandya delivered figures of two for 45 in 10 overs and choked the run flow during the middle overs. Skipper Kohli's stand on the kind of balance that the Baroda all-rounder brings to the side stood vindicated during another controlled bowling effort by the visitors. Save the 119-run fourth wicket stand between Ross Taylor (93 off 106 balls) and Tom Latham (51 off 64 balls), New Zealand couldn't really accelerate against the Indian attack on a pitch that was a touch slower compared to the second ODI. Mohammed Shami (3/41 in 9 overs), who had all but sealed the third seamer's spot for the World cup, once again provided the initial breakthrough as Colin Munro (7) edged one to Rohit in the slip cordon. Martin Guptill (13) then got a delivery from Bhuvneshwar Kumar (2/46 in 9 overs), which moved a shade after pitching. The resultant nick was taken by Dinesh Karthik, replacing an injured Mahendra Singh Dhoni (hamstring) behind the stumps. Kane Williamson's (28) bane in the series has been not capitalising on good starts and it was no different in this game either with Pandya coming into the focus with an impressive catch at the mid-wicket off Yuzvendra Chahal (2/51 in 9 overs). Chahal shortened the length as Williamson came out. The home batsman couldn't control his flick shot and an agile Pandya did the rest. Pandya's bowling was sharp as he got a few to rear up to both Taylor and Latham, who resurrected the innings from 59 for 3. Pandya's first spell read 5-0-9-0 with 23 dot balls. In his second spell, he did get some stick but removed Henry Nicholls and Mitchell Santner in successive overs. The first was a slow bouncer that climbed on Nicholls while the second was a length ball that was edged by Santner. This was after Latham and Taylor were dismissed to leave New Zealand struggling. The next match is in Hamilton on January 31.